0.250" (6.35mm) dia x 0.500" (12.70mm) long. Bullet Shaped, North at tip, South at base. 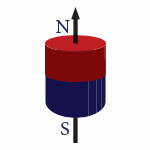 N50 Rare Earth Neodymium Cylinder / Rod Magnet, Magnetized through the length. Nickel plated.